I’m happy to have made top 10 in all of the races – excellent practice/preparation for all the positioning that is going to happen in the upcoming Sunny King and Athens Twilight pro crits. It looks like WordPress is starting to overlay ads on top of each of the videos … click the “youtube” icon on each video to watch a version of the video without an ad. 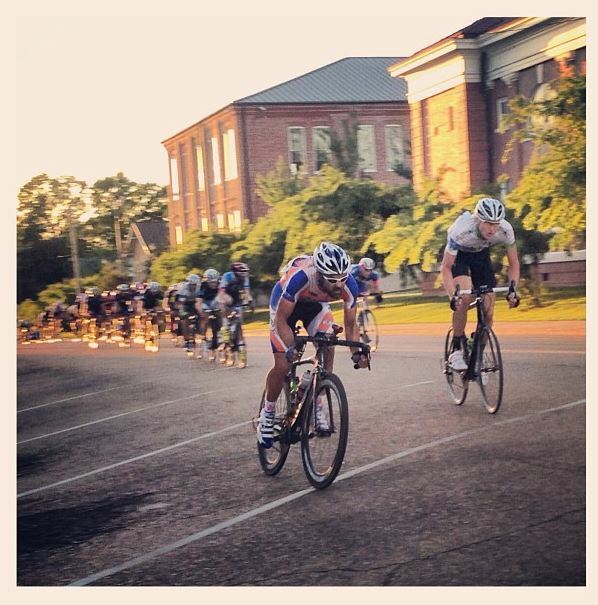 New, fast course this year with a new combination of roads in the downtown part of Brookhaven. I brought my family this year, so after we finished the drive from Birmingham I left them at the hotel and biked over to registration so that they didn’t have to get to the race start quite so early. I was riding through downtown admiring everything before the race got crazy when a pickup truck passed me and clipped me with his rear view mirror. Other than a sore back (I was very lucky that his mirror collapsed immediately and it was tall enough to clear my handlebars), I was OK. What a crazy start to the weekend. After a quick stop by registration, I continued my long warm-up by heading over south of town through the old antebellum homes underneath huge oak? trees. It was a nice relaxing way to warm-up for what was a pretty intense race. ThinkFinance was the primary instigator constantly sending riders off the front. I tried to get in a few of the moves and attacked once or twice myself (Kristine got this great picture of me attacking to bridge up to one of the ThinkFinance riders) but with many highly motivated racers competing in a timed stage race, everything was getting brought back together. Along the way I managed to lose a very close finish for a $50 prime sprint at the halfway point of the race. Kristine got this great picture of me attacking to bridge up to a ThinkFinance rider who was off the front. We lasted less than half a lap off the front. With about 6 laps to go I was still pretty close to the front of the race, and I managed to find myself on the wheel of Michael McBrien (Bikes Plus Racing) a super strong sprinter from Pensacola – who himself was glued to the wheel of Mat Davis (Team La’Sport) another strong sprinter. I’m thinking “this is perfect!” – but then on the second to last lap I got pinched between two riders heading into turn 1, hit the brakes briefly, and lost several positions by the end of turn 1. I tried to work my way around again, but I had lost the good wheels and ended up starting the sprint from about 8th spot and finishing in 6th. Colton Jarisch (ThinkFinance) took the sprint, followed by Michael McBrien (Bikes Plus), and then Mat Davis (Team LaS’port). The three of them were pretty much a photo finish for the first three spots. A few meters behind was Bryant Funston (Marx and Bensdorf), Woody Boudreaux (Herring Gas), and then me (Friends of the Great Smokies). This year’s race started out a bit slower than last year with me not attacking from the start line. It took less than a mile though before riders started launching off the front … Scott Kuppersmith (Absolute Racing) and Marx and Bensdorf had some initial solo attacks, but then it was a ThinkFinance rider and a Marx and Bensdorf rider (Brett Shanaman?) who finally broke the elastic sticking a two man move that got quite a bit of time on the field (maybe a minute or more?). Herring Gas and Team La’sport settled into a steady mode of chasing with a few attacks interspersed, but it took about 25 miles of the 27.5 mile lap before the two-man break was reeled back in. Towards the start of the second lap, I got into one promising looking move, but then I ended up struggling a bit with some of the counter attacks and the cross-winds — hoping that none of those attacks would stick b/c there was no way I was going to be able to bridge across. Fortunately, everything was coming back together. By about midway through the third lap, it was pretty clear that nothing was going to get away. Again, I found myself in great position heading into the final sprint again on Michael and Mat’s wheel. But about 3K before the sprint started in earnest there was a surge and in the reshuffle I slid a few spots back. I started the sprint this time from maybe 10th wheel, but as it was a long sprint I was able to pass a few of the guys who were fading to end up in 7th. Colton took the field sprint for his second win in a row. Michael was moving up fast but then as the sprint shifted over, Michael ended up off the left side of the road on the gravel (you can see that on my video). Blair Krogh (4D Fitness) flew up the right-hand side to take 2nd with Mat in 3rd. I was on Bryant’s wheel as we were passing everybody, but he made it around Andrew Hammond (Herring Gas) and Woody (Herring) to take fourth whereas I didn’t quite make it around either of them … if only the line had been 5 meters farther down the road … so I ended up 7th. As much as I love racing, and as much as I dread time trials – this was probably still one of the highlight from the weekend. And it has been for the past three years — from three years ago when Justin Bynum, Pat Allison, and I all did ghetto skinsuits (wear the bibb shorts over the jersey) to last year’s Strava climbing challenge where I did maybe 100-150 repeats on a tiny 30 foot hill to eek every ounce of elevation gain out of my 2.5 hour warm-up ride to this year’s adventure of riding to the start and back from the hotel on some cool backroads watching a beautiful sunset while my wife and kids went roller skating at the Brookhaven skating rink. The time trial always seems to pull through in the fun factor even if my legs cannot seem to pull through to not absolutely kill my standing in the overall. This year, I even had help from the awesome guys at 4D fitness (Blair Krogh, William Jones, Daniel Wisner, Dustin Drewes) with Dustin loaning me his disc wheel to replace my Reynolds with a broken spoke (I forgot to mention that in my write-up about the road race — I broke a spoke in my rear wheel in the road race, either just riding around or during the sprint). Saturday time trial – heartrate zone summary. Colton crushed the time trial to take his third win in a row, but behind him the times were pretty close leading to a somewhat tight GC battle for 2nd-10th spots. The one potential benefit of a lousy time trial is the chance for more freedom in the circuit race. Unfortunately, there were a lot of riders close in the overall so ThinkFinance needed to watch pretty much everyone. When Kenny Bellau (Herring Gas) geared up to attack into the headwind on the backside of the course on the first lap, I was already right behind him so I went with him to test the waters. We never got more than a few seconds before being reeled back in. This played out a few more times before it became clear by the end of the first lap that ThinkFinance was going to ride the front of the race at a fast pace to discourage attacks and then if anybody got away, just continue to average about 26-27mph until the break was reeled back in. This was a very effective strategy. When I went to position myself for the bonus sprint at the end of the third lap, I realized that there was no way to get around the ThinkFinance train. With all of the fighting for position happening behind the train, I realized that joining the ThinkFinance train and helping to work would be more effective than all the jostling/fighting for position behind. On the fourth lap, I worked my way up the left side waited for an opening and then surged the remaining few spots to pull alongside the ThinkFinance team leader, Colton Jarisch, who was riding behind the rest of his team plus Stephen Mire from Team LaS’port who was employing the same strategy to help keep his teammate Mat Davis second in the overall. I asked Colton if I could help work in his train – he said “sure” and let me in front of him. One of the smoothest trains I’ve been in, we rotated well for the remainder of the fourth lap and then all the way through the rough road on the fifth lap. Then, the pace wasn’t quite fast enough and several riders drilled it up the sides causing quite the reshuffling. I ended up a few spots behind the train, but it did make for some great video of the lead-up to the final sprint as I watched Mat and Colton positioning themselves a few riders ahead of me. I ended up on Mat’s wheel for a while trying to move back up. Then I made a big mistake of trying to come around Mat when it seemed like he was too far back. Mat went on to finish 2nd behind Colton (who completed a clean sweep of all the races), whereas I ended up 6th so I would have been better off just staying on Mat’s wheel. Andrew Hammond (Herring Gas) had a strong sprint to take 3rd – good view of the sprint in the video below. Analise rescued this turtle from the race course on Sunday. These are the only two alligators I saw. Kristine took the kids roller skating while I was doing my time trial. My ride over to the course involved two roads (Doolittle and Fern) I found on the map that I was hoping would be unpaved – unfortunately, they were both paved but it still made for quite an adventure! Speaking of trees, these beautiful trees were all over town. I’d call them oak trees, but there wasn’t any pollen so I’m not sure what kind of trees they are. After a four and a half hour drive from Birmingham, the kids immediately found a tree to climb. Here’s all the data from my races, including the lap power data from Friday’s crit. This entry was posted in Racing and tagged circuit race, criterium, msgp, race, road race, time trial on April 16, 2013 by kartoone.